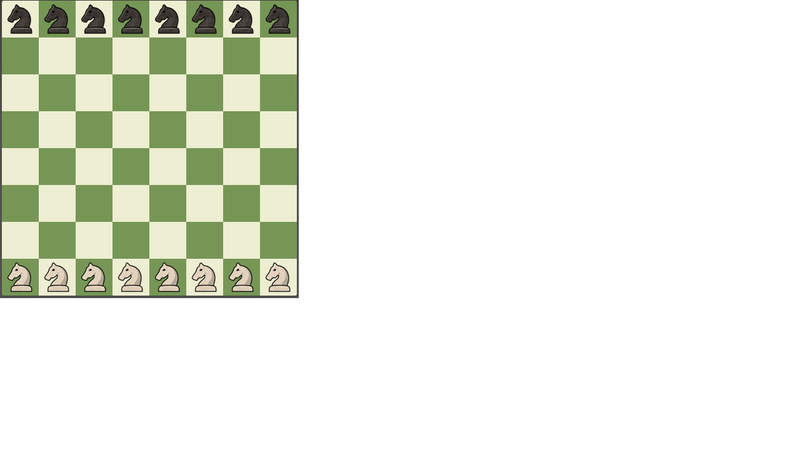 Both Players uses 8 Knights on this chessboard game : The Knight Checker. All pieces starts in Rank 1 relative to players. 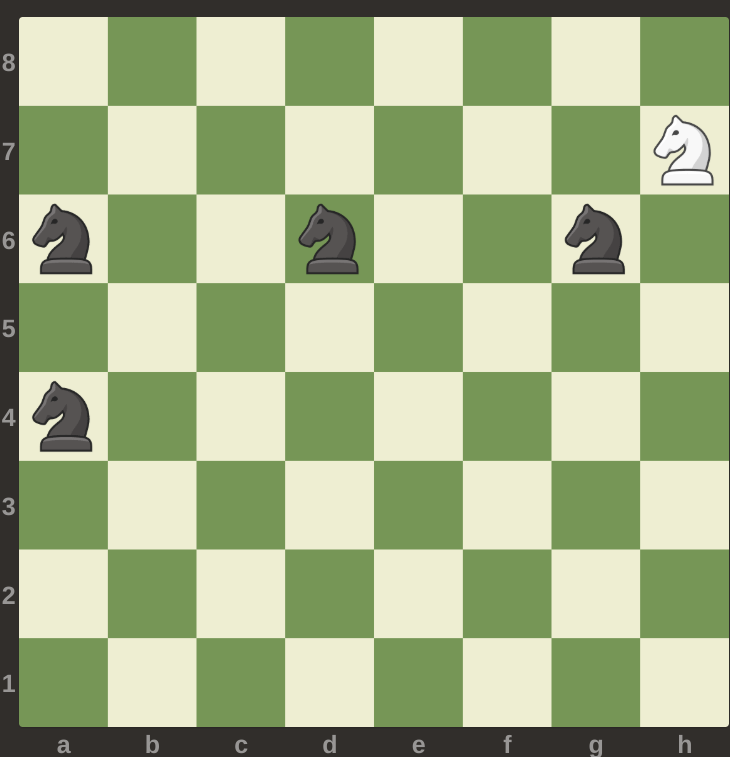 White to move first. The Knight pieces makes regular moves as in a chess game rule. They can capture or tackle opponent piece and moves in any direction. To win one knight of any player must touchdown or move to Rank 8 first (or capture on rank first) without being captured by opposing knight. Also to win by capturing all opponents pieces. Is it possible that a games ends in a draw? That is , Black or White can not force a win. I know this is a late answer, but I think I may have something! The draw is 1. Nf6 Ne7 2. Nd7 Ng6 3. Nf6 Ne7 4. Nh7 Ng6, etc. White is forced into this. He can't move to g5 on turn 1 because of 1.....Nc3 with an unpreventable touchdown on b1. On Nf8, Nxf8 (assuming Evargalo's comment is correct) puts an end to that. So White must play 1. Nf6. Now, White is threatening to touchdown on g8. The only piece that can reach g8 is the Ng6, so Black plays 1..... Ne7, preventing the goal. Now, White has two choices that threaten a touchdown- d7 or h7. (If White doesn't threaten a touchdown, Black can play Nc3.) Either way, Black must play Ng6 to prevent the touchdown on f8. Now, the Na4 is guarding b6, White can't play his knight there, so to threaten a touchdown, White must play Nf6. Black must play Ne7, and the cycle continues, until a three-move repetition! A draw is possible, in the above position. Not the answer you're looking for? Browse other questions tagged chess game checkerboard knight-moves or ask your own question.